Preferably someone with experience in the machining of unique advanced materials would be a plus. Experience: Minimum 5 years selling in to the Secondary Advanced Materials/Composites industry. Preferably CNC machines for non-ferrous metals and or composites. Ideal candidate would have experience in the advanced materials/composites industry but would consider candidates with a parallel path of experience from the Aerospace, Marine, Energy or Plastic, etc. industry. 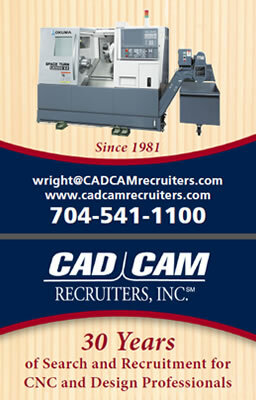 Position is responsible for sales/support for the company’s CNC Advance Materials processing machinery. Such responsibilities include but are not limited to, technical sales support sales network, software demos, prospecting, qualifying, closing sales. , Attending trade shows, attending industry related networking and educational events and maintaining post sale relationships. Further responsible for maintaining all administrative requirements such as sales forecasts, call reports and CRM updates. The position requires extensive travelling within the territory of responsibility. 1) Present and sell company’s capital equipment and services to current and potential customers. 2) Prepare action plans and schedules to increase sales volume in the territory. 3) Follow up on new leads and referrals resulting from field activity, trade shows, etc. 4) Identify sales prospects and contact these and other accounts as assigned. 5) Prepare presentations, proposals and sales contracts. 6) Maintain sales materials and current product knowledge. 7) Establish and maintain current customer and potential customer relationships. 8) Identify and resolve customer concerns. 10) Prepare a variety of status reports, including activity, closings, follow-up, and adherence to goals. 11) Communicate new product and service opportunities, special developments, information, or feedback gathered through field activity to appropriate company staff. 13) Other duties as assigned. 1) Participate in marketing events such as trade shows and seminars. 2) Follow-up for collection of payment. 3) Coordinate shipping schedules and delivery of merchandise and services. 4) Membership of and attendance at industry related professional organizations.